New Customers MUST know your name to be credited. Snipz N' Tailz is inspired by the experiences and lives of rescued animals. After several years of fostering animals for rescue organizations in the greater Milwaukee area, I witnessed the frail and desperate conditions that these animals arrived in. I began grooming as a personal mission to renew hope and rejuvenate their spirits so that they could have a fresh start to their new lives! I love getting to know each of my clients individually and I know how important your pets are to you. I am dedicated to making your pet feel as comfortable and pampered as my own. 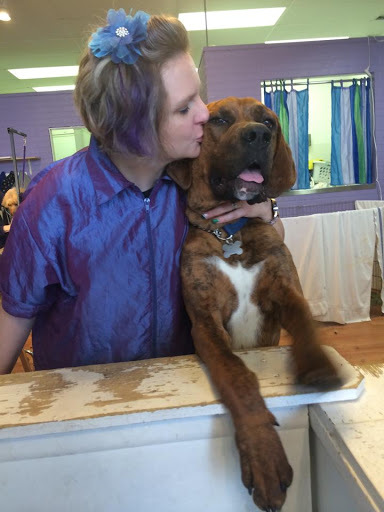 Often times, well socialized dogs who get along with others are free to roam the shop before and after their groom. I look forward to providing your pet with their grooming needs. Call me to day to book an appointment!